This is the first time I’ve been at the famous Morgenstreich of the Basel Carnival. You have to earn it! Every year, a special train chartered by the SNCF (the French railways company) takes the Alsatian participants to what is the most famous carnival in the region. The train leaves Strasbourg at 1:15 am, stops and takes travelers at Sélestat, Colmar and Mulhouse before arriving at Basel a little before 4:00 am. 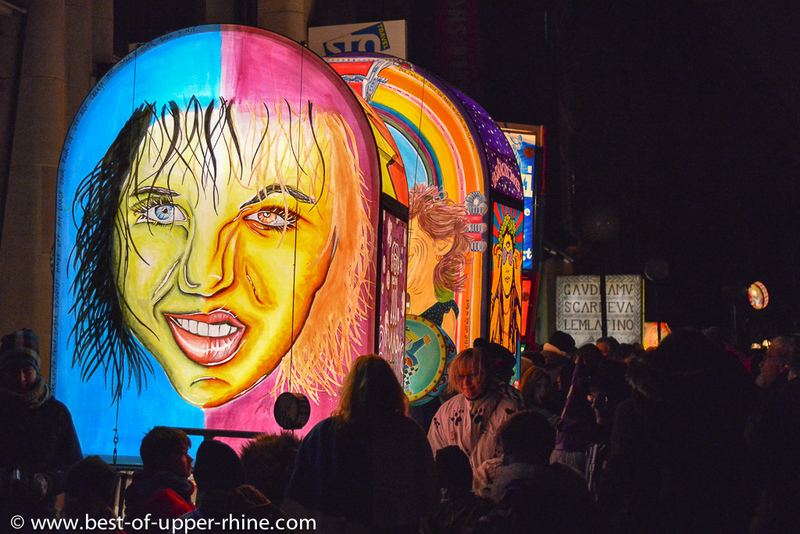 The Carnival of Basel begins every year at 4 o’clock in the night, the Monday following Ash Wednesday and goes on for 72 hours of colorful festivities. My alarm clock was set to 0:45. At 1:50, more than a hundred travelers press on the platform at Sélestat train station. A huge train arrives … 10 cars. The first 7 are overflowing. Colmarians that are on the route will have to jostle to find the place. I wondered what success this special train at night could have, now I know. There is even a second special train scheduled from Mulhouse. The day before, at the carnival parade of Mulhouse, I learned that there was a sort of tradition: people of Mulhouse are flocking to the Morgenstreich which always takes place the Monday following the Carnival of Mulhouse. Traditions are alive, especially when we know that Mulhouse was Swiss before being annexed by France in 1798. So the two trains arrive at the Basel station and soon a human tide that goes like a huge snake rushes to a city plunged into complete darkness for the occasion. The Morgenstreich started. It’s magic. This is so exceptional that it is difficult to speak about. Morgenstreich has to be experienced … Here some pictures. 7:21, Basel SBB station. The train for Strasbourg goes. Crowded. Everyone looks groggy, like after a long journey with big jetlag. A beautiful sun soon illuminates the plain of Alsace, chasing the gray of the past days. Ages ago, the magical rites of the Celtic populations which later gave birth to carnival festivities were to cast out demons of winter and to welcome spring and the rebirth of life. The prayer of these some 12,000 luminions and magic lanterns would it have been heard? This is the first time that I attended at the Basel Carnival Morgenstreich. For sure this is not the last. 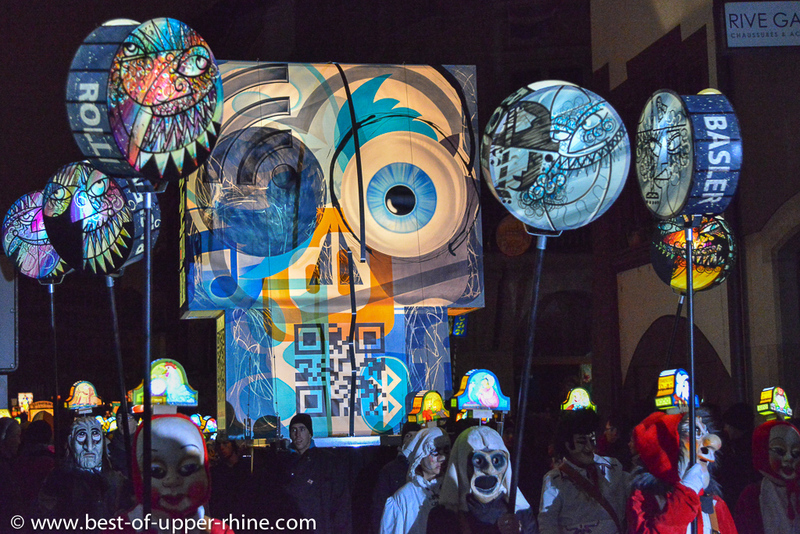 Every year, some 200 large lanterns form the structure of the Morgenstreich parade. True works of art, they evoke in a satirical and humorous way the major themes of the year. Basel Fasnacht certainly goes back to the dawn of time. During the earthquake of 1356 the city was destroyed, as well as many documents and archives. So one of the first documents to mention a raging carnival goes back to 1376 (twenty years after the earthquake). 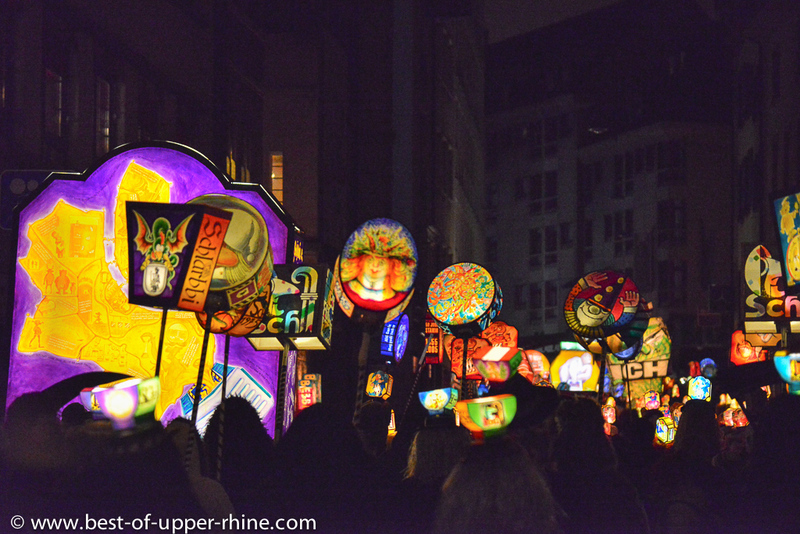 While virtually all carnivals in the world end on Ash Wednesday, since the year 1529, the Basel Carnival begins each year on the Monday after Ash Wednesday at 4:00 am with the Morgestraich (als) (or Morgenstreich) a parade of lanterns. Morgenstreich large lanterns. The year 1860 saw the appearance of the first large lantern during the Morgenstreich. The oldest document proving and certifying the trade of masks by artists and merchants of the city also dates back to 1529. The first “Morgenstreich” starting at 4:00 am and accompanied by a large procession dates back to 1835. Ten years later, it is prohibited to carry torches for safety issues. Lanterns on sticks (Stecken) are replacing them. The year 1860 saw the appearance of the first large lantern at the Morgenstreich. The festival lasts exactly 72 hours ending Thursday at 4am. The people of Basel call these three days of carnival “the three most beautiful days of the year” (“Die drey scheenschte Daag”). During the carnival the fifes and drums resound throughout the city of Basel and this for the sake of the flock of locals and tourists. Cliques (carnival associations) roam the streets, invade cafes and shops. The badge of the Carnival of Basel 2013. It is the mark of visitor support, which helps keep the event independent of any sponsor. The badge named “Plakette” is a kind of ticket to the Carnival of Basel. It is not mandatory to buy it, but its acquisition is very popular because the money from the sale is used to pay a large share of the costs of the procession Monday and Wednesday. Money is reinvested in the new theme and topic of the next year. Most badges are sold by “cliques” themselves, and allow them to cover part of the costs incurred in the preparation of the carnival. There are 4 categories of badges. Badges are also sold through the streets by occasional small merchants or newsstands. During the carnival, the carnival committee sets up stalls: at the Marktplatz and Claraplatz during the three days, on Tuesday when lanterns are exposed at the Münsterplatz and Mondays and Wednesdays at the Barfüsserplatz. 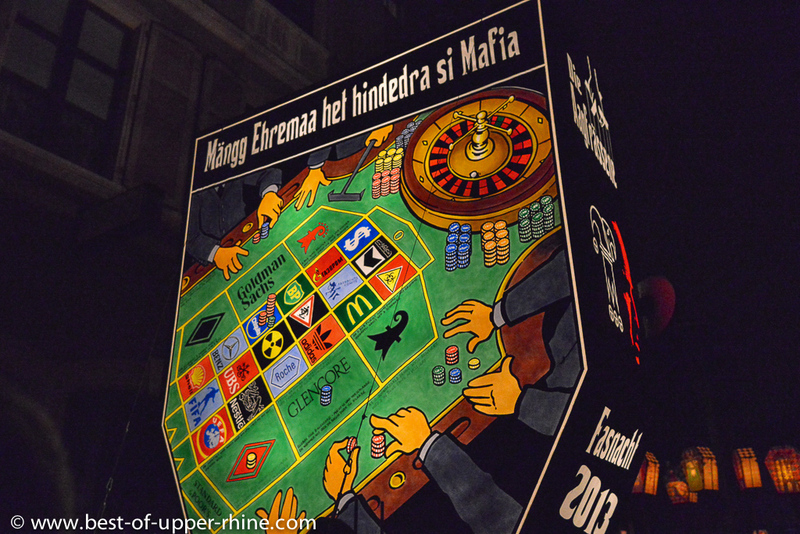 Basel Carnival Committee (German / French / English). This website is worth a visit and in detail: it is a mine of information on the history of the event, its preparation, the program and its development. And also on the things to know to respect the spirit of this wonderful event. For visitors staying in one of our holiday apartments in Riquewihr (and La Vancelle), we recommend to take the night train from Strasbourg to Basel Special station in Sélestat. One return ticket fixed at EUR 31 allows you to travel up to 5 people (price 2013)! The Morgenstreich begins at 4:00 am in the city center of Basel. Do not get there by car.